It takes about 30 minutes on a good day to reach the front of the queue in the butchery section and order a selection of the meat and sausages, which are then cooked in a separate kitchen. Waiting for the food can take up to two hours on a busy day, time which is generally wiled away with drinking and dancing. Mzoli’s itself does not have a licence – instead the entrepreneur spirit has spread to neighbouring families who make a business out of selling alcohol to visitors to Mzoli’s, a controversial practice that is subject to occasional legal crackdowns. Searching for a table is hopeless, unless it’s been reserved in advance. A small group might be able to join another group at a table since people are generally friendly and inviting. This may, indeed, be due to alcohol consumption but to us it seemed that they were simply nice people. 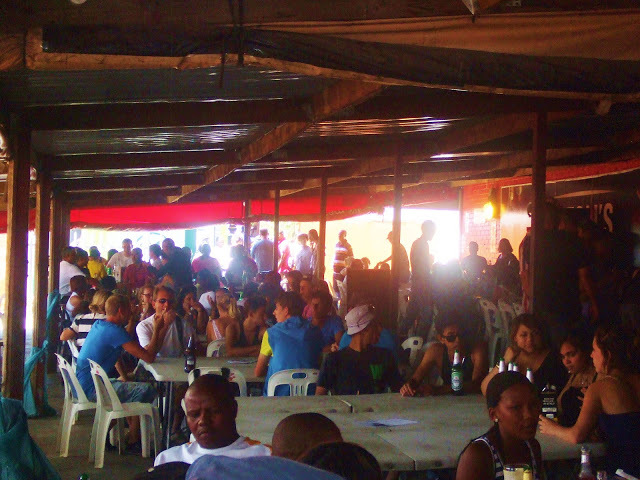 Mzoli’s is filled with people dancing to a stream of kwaito music unrecognisable to the foreign visitor. Nevertheless, once a space is found, we could not help but move to the rhythm, even cheering along with the crowd each time another new, equally unrecognisable song came on. The combination of the music, the clientele and the overall atmosphere gave me the impression of being in a club somewhere in Mexico rather than in the townships of South Africa. As time went on, the tabletops filled with empty bottles and cans, the crowd became louder and the dance moves more enthusiastic. It was the kind of atmosphere where one has to be at least slightly drunk to have a good time. And a good time we had, without a doubt. Naturally the consumed liquid has to come out one way or another, which explains why the bathrooms, especially the ladies, were blocked by a long queue. Some girls (me included) headed instead for the men’s bathroom. There I realized again how generous and forthcoming people are, with one man even offering to hold the door closed for us, since there was no lock or door knob whatsoever. The convenience of not having to wait in line and making temporary friends led to a little queue of several women inside the bathroom. Forget about privacy, it’s overrated. When our food finally arrived, after almost three hours of dancing and drinking, we homed in on the steaming pile of meat with ravenous appetites. No knives, no forks, no serviettes, no bread, no veggies or salad. Just meat on a plate. And it was so good. We stuffed the food into our mouths until we were bursting. It was time to go home. The sun was low in the sky and drunk drivers – watch your feet, being in front of the car does not mean it will stop driving – and beggars stayed close to our side. For those who have never been to Mzoli’s, it might be overwhelming at first. But once you accept the lack of hygiene and the masses of people, Mzoli’s is a fun and joyful insight into another part of South African culture. Where is the best place to catch a taxi to Mzoli’s? Thanks.